Did Paul McCloskey lose to DeMarcus Corley? Last night in Belfast, Paul McCloskey was stopped in the tenth round by DeMarcus Corley who controlled the pace of the fight from start to finish. The usually loud Belfast crowd didn't have much to cheer about as almost all of the eye-catching punches were thrown by the veteran Corley, especially in the tenth round. Some people didn't like the stoppage, but I have no complaints. Look at it this way, McCloskey was wobbled several times throughout the fight, he had a broken nose, he was getting hit by almost every power punch Corley threw and he never really landed a clean combination to the chin of Corley. "Gutted for Paul..he wasn't at the races tonight but no complaints with the stoppage." "No complaints with the stoppage? You on crack? No cut and not dropped? Prob would have been put down at that stage, but can't assume." "Were you there? I was 10ft away, in the ring after and in the changing room. U can be as brave as you wish but safety comes first." "CONGRATULATIONS CHOP CHOP, A PRO'S PRO AND A MAN'S MAN. Proud to promote you. You have rebuilt your career." 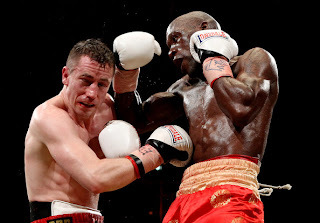 "At 37 DeMarcus Chop Chop Corley continues to turn back the clock with TKO10 over Paul McCloskey in Ireland." So it turned out to be a very disappointing night for Paul McCloskey, but I'm sure he can come back from the loss, but for now he doesn't belong at world level. With two good wins in a row, Corley has earned himself a world title shot at 140 but I doubt the title holders at Light Welterweight will want to fight Corley because of his 'High-risk, Low-reward' status. Who do you want to see DeMarcus 'Chop Chop' Corley fight next?